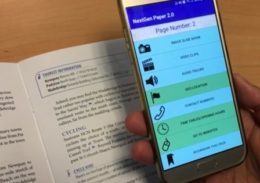 Professor David Frohlich from the University of Surrey was invited to demonstrate the first interactive travel guides at the ‘Paper Magic’ exposition in the COMM museum in The Hague. It was the first time Next Generation Paper was presented to the general public. What seemed only a nice gadget at first glance, turned out to be a book that inspired many visitors from different professions. The travel industry, graphic design, education and librarians. David and his team showed an augmented travel guide with multimedia links coming up on a mobile phone. This content includes extra pictures, videos and interviews with local characters in the area, made and selected by the well-trusted brand Bradt. The technology is developed to work with InDesign and you can add multimedia links to published books in retrospect. The visitors also loved the ‘magic’ in the 3G travel guide: hidden electronic sensors in the fibres of the paper itself to recognise which page is open and what regions people are touching. What stories told by local people add to travel guides, may visuals and music add to school books for children with reading disabilities. Or imagine how children can create their own multimedia essays, including their favourite characters, animations and drawings. “We don’t know what will happen in the future”, said David Frohlich. “But there will be a post-digital era that includes tangible objects. Until now, there was nothing designed for print and digital in one.” This has changed with Next Generation Paper. The Travel Guide will be commercially available in spring 2019.